NIA CHARLESTOWN NEVIS (February 19, 2015) — The Nevis Island Administration (NIA) forged a partnership with Caribbean Helicopters Ltd. (CHL) based in Antigua which will bring added airlift to the Vance W. Amory International Airport. 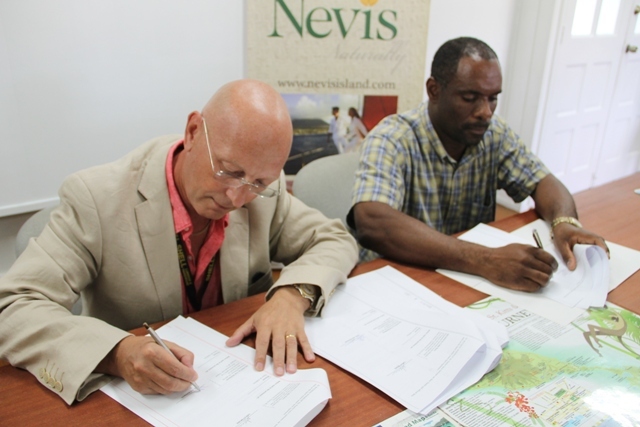 The agreement was signed on behalf of the Administration by Permanent Secretary in the Ministry of Finance Colin Dore and Director of CHL Neil Dickinson at a brief but significant ceremony at the Nevis Tourism Authority’s (NTA) Visitor Centre on February 13, 2015. In brief remarks Mr Dore said the island had struggled with the issue of airlift in and out of Nevis via Antigua for too long and the new partnership would set Nevis on a path that would provide a level of convenience not only for Nevisians but also for visitors to and from the island. He urged Nevisians to utilise the new flight and gave the assurance that the NTA and the NIA would do all the marketing necessary to build awareness of the flight. Dore stated that the new airlift would bring benefits to Nevis and it was the intention of the NIA to continue to work with all its partners to find ways to continue to expand the airlift into and out of Nevis. He said the main focus was the traveller’s convenience and as such the Administration and the NTA would do all that they could to provide a greater level of convenience for both local travellers and visitors. Meantime, Dickinson said CHL was proud to enter into the agreement with the NIA. He explained that CHL was a Caribbean company which had existed for more 20 years, primarily as a tour operator based in Antigua. According to Dickinson, CHL’s vision was not only to provide an adequate service at present but also to seek to ways to develop the service to bring more people to Nevis. “We believe there is a lot of synergy between Antigua and Nevis and day tours for existing people staying in Antigua is a very great possibility. We are already exploring quite a lot of success. So we are looking forward to this,” he said. CHL has a fleet of three Bell 206L long-range helicopters which Dickinson stated visited the islands frequently bringing tourists and doing charters. However their service would be expanded with the addition of two fixed winged airplanes. “Our two fixed wing airplanes are going to start to do the airlift between Antigua and Nevis very shortly. The plan is that we increase that fleet by a further two aircrafts in the next six months,” he said. Initially CHL will have two flights a day on Fridays and Sundays with plans to later include two flights on a Wednesday. Dickinson said the company would be monitoring the demand and if it grows as it is expected to, it would become a daily service between Antigua and Nevis. Bookings could be made via the CHL website www.caribbeanhelicopters.com through the reservations number provided there.